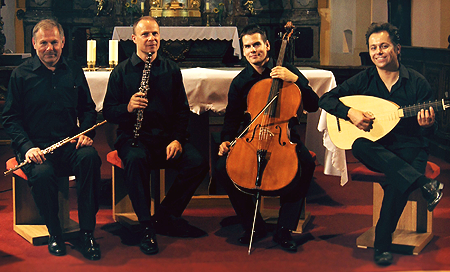 The chamber ensemble Quartetto Telemann was founded by musicians from the National and Smetana's Theatre Orchestras in Prague in the late 1980s. All of them are successful and experienced performers both at home and abroad. An ensemble with an unusual composition - flute, oboe, guitar and cello came into existence. The flutist changes recorders, the oboist English horn, the guitarist lute and the cellist viola da gamba. This enables interpreting music of all styles from the Renaissance to the contemporary music. However, it is the music of Baroque and Classicism which dominates the repertoire. In 1992 the ensemble recorded a CD that has been regularly reprinted for great interest . It also realized a few successful tours abroad and hundreds of concerts at home. The flutist Vladimír Petr is the art leader and the solo-oboist of the Prague Radio Symphony Orchestra David Prosek plays the oboe and the English horn. David Holý, a young and very promising graduate of prof. Milan Zelenka plays the guitar and Václav Petr, Czech Philharmonic concert master, plays the cello. Music of the Renaissance, Baroque, Classicism and of the 20th century is supplemented by a very successful programme "Famous Encores of Famous Composers". Not least part at its success play master arrangements composed exclusively for the ensemble Quartetto Telemann (the suites from the musicals My Fair Lady, West Side Story, Porgy and Bess and from the film Snow White etc. ).This programme was also recorded on CD in 1999. Every year the ensemble performs more than a hundred concerts not only in concert halls, castles and chateaus all over the Czech Republic and abroad, but also in exceptional and today very attractive rooms - eg. in the caves of Moravian Karst (Macocha, Balcarka) and in Koněprusy caves.